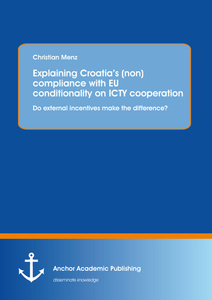 Explaining Croatia’s (non)compliance with EU conditionality on ICTY cooperation: Do external incentives make the difference? For the positive experience with tying progress in negotiations with progress in reform in Central and Eastern Europe (CEE) the European Union (EU) made its membership offer to the Western Balkans (WB) countries conditional on specific democratic principles, most notably (full) cooperation with the International Criminal Tribunal for the former Yugoslavia (ICTY) and respect for the Dayton Peace Accord. Yet, although EU membership is regarded as highly attractive both for political elites and the general public in the region, the erratic record of compliance with ICTY-related EU conditionality raises questions about the EU’s ability to provide for ‘rule transfer’ and ‘norm diffusion’ in the current enlargement round and poses a puzzle to scholars of international relations and EU enlargement alike. has been given limited attention only on a few pages as a (small) part of broader analyses (Schimmelfennig et al. 2006: 78-96; Schimmelfennig 2008). Moreover, in recent examinations it has been doubted whether the EIM as a rationalist model would be an adequate framework for the explanation of (non)compliance with ICTY conditionality (Freyburg/Richter 2010; Rajkovic 2007). Nonetheless, these studies – even though they refer to the EIM – build on research designs different from that of the EIM. Apart from that, there have been numerous examinations of ICTY cooperation of the concerned WB target states, but for the most part they have not been theoretically informed and thus remained descriptive. For these reasons, the EIM will be taken as the overall framework for analysis. The theoretical part of this paper starts with a short general overview of the literature on external factors of democratization and their impact on the domestic level. Subsequently, the external governance approach will be outlined as an adequate concept to detect the mechanisms underlying EU policy transfer and norm diffusion to third countries. Moreover, the logics of rationalist and constructivist theoretical reasoning will be pointed out in order to illustrate the underlying assumptions of the EIM. Thereafter, the current state of empirical knowledge on (non)compliance with EU conditionality will be discussed and existing research gaps identified. The empirical section is guided by the assumptions of the EIM and uses process-tracing to identify crucial factors that could explain Croatia’s inconsistent pattern of compliance with ICTY conditionality. In the conclusion, the main findings will be examined against the background of recent research on compliance with ICTY conditionality that at least partly rejects rationalist assumptions preferring constructivist reasoning instead. Having turned more or less a blind eye to it before, in the beginning of the 1990s scholars in the field of democratization research started to take into account external factors (cf. Grugel 2005). However, “the international dimension of democracy promotion nonetheless remains at best understudied and poorly understood” (Schraeder 2003: 22). There is a lack of systematic, theory-driven research about the interaction and interdependence of internal and external factors as well as about under which conditions external actors are able to influence domestic reforms and ‘transfer’ their rules (cf. Magen/Morlino 2009: 11-12). The limited number of thorough empirical and theoretical studies on internal-external linkages of democracy promotion can partly be ascribed to the rather isolated disciplines of international relations (IR), comparative politics, institutionalism and international law which resulted in “largely separate, independent and self-contained spheres of inquiry” (Magen/Morlino 2009: 11). While IR scholars have often neglected the domestic scene, political comparativists have tended to fade out the role of external actors and ideas (cf. Flockhart 2005b: 2-10; Moravcsik 1993: 5-17; Whitehead 2004: 139-141; Yilmaz 2002; however see Cooley 2003; Levitsky/Lucan 2006). Concerning the latter, as a sub-discipline of comparative politics, the transition literature provided valuable input to the understanding of domestic democratization processes. It elaborated on crucial systemic factors for processes of liberalization, institutionalization and consolidation, such as the party system or the constitution (e.g. Birch 2003; von Beyme 2001; Bunce 2003; Elgie/Zielonka 2001). Moreover, important insights were provided on the political economy of negotiation processes between incumbent elites and reformers during regime change (e.g. Haggard/Kaufmann 1997; Przeworski 1991) and the significance of ‘state-building’ and ‘nation-building’ as a precondition for democratic consolidation (e.g. Linz/Stepan 1996). Regarding the links between the domestic and the international scene important contributions have been made within the IR discipline. The ‘second-image reversed’ theory (Gourevitch 1978) from IR research has provided a highly valuable framework to study how systemic factors of the international system influence political outcomes at the level of nation states (cf. Pevehouse 2005: 4). Putnam (1988) finally combined the international and domestic scene in his ‘two-level approach’ which assumes that domestic actors have to calculate costs and benefits at different “playing fields” with different “win sets” both in international negotiations and in domestic politics. Nonetheless, the literature on external democracy promotion predominantly takes the point of view of those countries actively engaged in anchoring democracy abroad – their motives, instruments and strategies – rather than looking at the experiences and effects in the target states or the internal-external linkages of democracy promotion (cf. Magen/Morlino 2009: 12). The recent eastern enlargement of the EU as a natural experiment enabled researchers to investigate the links between the domestic and international sphere in more detail. Yet although eastern enlargement has been subject to countless analyses, for to the most part they remained descriptive or methodologically weak (cf. Schimmelfennig/Sedelmeier 2005d: 4). Nonetheless, increasingly sophisticated book-length research projects helped to identify crucial variables which influence processes of EU ‘rule transfer’ to third states, be it via enlargement (Grabbe 2006; Kelley 2004a; Linden 2002; Schimmelfennig 2003; Schimmelfennig/Sedelmeier 2005a; Schimmelfennig et al. 2006; Vachudova 2005), in the context of pre-accession negotiations (Blockmans 2007; Richter 2009b) or via the European Neighbourhood Policy (ENP) (Emerson/Youngs 2009; Weber et al. 2007; Youngs 2008). However, it remains unclear to what extent the inferences drawn from these studies can be applied to other related subfields as they mostly focused on single enlargement rounds, policy areas, or single countries whereas “rigorous comparative analysis of the EU expansion-democratization nexus has remained sparse and fragmented” (Magen/Morlino 2009: 15). Most prominently the EU engages in non-member countries via enlargement, the Union’ most successful foreign policy tool according to the Commission (2003: 5). However, enlargement policy as the main foreign policy instrument might recede into the background in light of the EU’s limited ‘integration capacity’ and the small number of remaining European states eligible for membership. Furthermore, with the establishment of the EU’s Common Foreign and Security Policy (CFSP) in the 1990s and the launch of the ENP at the Copenhagen European Council in 2002, the Union institutionalized its external relations with non-candidate countries that are perceived to affect the EU’s stability, security and economic well-being. Therefore, in parallel, the ‘external governance approach’ has been developed which serves as an overall theoretical concept for the analysis of the EU’s external action both toward countries with and without a membership perspective. According to this concept, the EU tries to gradually ‘externalize’ its governance to non-member states in order to meet its functional needs and to achieve both internal and foreign policy goals (cf. Lavenex 2004: 681, 694). In the words of Sandra Lavenex “external governance takes place when parts of the acquis communautaire are extended to non-member states” (2004: 683). Renner, on the other hand, defined external governance as “the ability of an actor to influence the rules that govern social entities beyond its borders” (2009: 4). The concept of external governance focuses on characteristics of specific systems of rules and the function of these rules in the EU’s external relations. It derives from the respective governance approaches in IR and comparative politics while, in contrast to traditional foreign policy analysis, it rejects the unified state actor model. Moreover, it neither focuses on countries nor regions as units of observation, but rather on multi-dimensional institutional processes of policy transfer and norm diffusion (cf. Lavenex/Schimmelfennig 2009: 794-795). Analytically, one can distinguish between two ideal types of external modes of governance: hierarchy and networks. Hierarchical or “old” (Schimmelfennig/Sedelmeier 2004: 674) modes of external governance are characterized by top-down communication as well as fixed, legally constraining institutional templates, which third countries adopt within vertical processes of command and control, often by the use of conditionality (cf. Lavenex/Schimmelfennig 2009: 796-797). “New” modes of governance via non-hierarchical networks, on the other hand, often include private actors and aim at the exchange of resources and/or trust (cf. Börzel 2009b; Héritier 2002; Scharpf 1997: 116-150). Therefore, the network mode of external governance is based on ‘rule transfer’ via learning and persuasion which makes it conducive to socialization processes (cf. Börzel 2006: 78-80; Börzel/Risse 2009; Checkel 1999, 2001; Schimmelfennig/Sedelmeier 2004: 673-675). These networks favor horizontal, flexible, non-coercive institutions for coordination and often involve instruments such as financial assistance, benchmarking, naming and shaming or voluntary agreements. However, the Commission as the main actor in enlargement policy predominantly only addressed governing elites whereas civil society or political (opposition) parties have not been subject of conditionality which suggests a predominance of ‘old governance’ modes (cf. Börzel 2009a; Grabbe 2006: 207-208; Pridham 2007: 449-450; Schimmelfennig/Sedelmeier 2004: 675; Wichmann 2007: 43-44). On the other hand, since 2004, the Commission has repeatedly stressed the importance of an enhanced “civil society dialogue” to strengthen cooperation with non-state actors during the accession process (e.g. Commission 2005a: 4). Moreover, the European Parliament, the Council or even individual member states have increasingly gained influence on enlargement issues which placed political constraints on the Commission and politicized the enlargement negotiations (cf. Pridham 2007: 455; Sebastian 2008: 10; Youngs 2009: 896). This might suggest that, first, instruments of network governance might be more widely used, e.g. through inter-parliamentary commissions and, second, that politics of enlargement will become more similar to the EU’s internal system of governance. Yet little knowledge exists on the impact of such changes on the EU’s ability to ‘externalize’ its rules. To provide a better understanding scholars draw from ‘compliance’ or ‘socialization’ research which aim at demonstrating why actors do (not) comply with specific (international) rules (e.g. Checkel 2001; Börzel/Risse 2002; Flockhart 2005a; Kelley 2004a; Schimmelfennig 2003; Zürn/Checkel 2005). Socialization research is concerned with processes of adoption, application and internalization of international rules and norms. In compliance research the focus is laid on conditions and instruments which enable international actors to initiate sub-systemic and domestic reforms. Since this branch of research is based on rationalist and constructivist institutionalism, let us subsequently first single out the basic assumptions of the social meta-theories of rationalism and constructivism. In institutionalism, there is a paradigmatic conflict between rationalist and constructivist authors due to different assumptions derived from two basic logics of social action: while rationalists assume a ‘logic of consequences’, constructivists assume a ‘logic of appropriateness’ (cf. March/Olsen 1998: 949). These ideal types translate into specific ontological premises such as that of an individualistic, materialist actor in rationalism who is calculating costs and benefits given his preferences and interests and his will to maximize his utility. To the contrary, in constructivism, actors rather follow a “social and ideational ontology” (Schimmelfennig/Sedelmeier 2005d: 11), i.e. actors are assumed to behave according to social and cultural norms, values and (socially constructed) identities (cf. Risse 2003: 107-110). Furthermore, these premises very often determine the concrete research design as well as the use of specific theoretical models. Rationalists presuppose a logic of consequences investigating the ‘externalization’ of domestic rules and consequently favor policies that strive for changing cost-benefit-calculations through social (e.g. status, international recognition) or material (trade opportunities, financial assistance) incentives (e.g. Vachudova 2005: 63-79, 108-110). Usually, institutions are considered as intervening variables, which may alter individual cost-benefit calculations by offering additional incentives or constraints, but they do not generate changes of identity or interests (cf. Schimmelfennig/Sedelmeier 2005b: 10). By contrast, authors of constructivist institutionalism explain socialization through processes of institutionalization and habituation as well as through deliberative, communicative processes of argumentation and persuasion (e.g. Checkel 1999, 2005a; Goodman/Jinks 2003; Risse 1999: 3). Finally, rationalists usually regard rule adoption as sufficient for a successful socialization process as it implies a change of behavior (e.g. Schimmelfennig et al. 2006: 3-4). On the other hand, out of a constructivist perspective only a reflexive change of attitude provides for internalization of norms as the final stage of successful socialization process (cf. Checkel 2005a: 808-813; Flockhart 2005c: 52-59; Wendt 1999: 262-278, 285-290, 302-311; Zürn/Checkel 2005: 1053-1054). Schimmelfennig and Sedelmeier (2004, 2005a) developed the rationalist EIM which is based on material bargaining mechanisms and centered on actors who are “strategic utility-maximizers interested in the maximization of their own power and welfare” (2004: 663; also see 2005b: 10). The EIM assumes that EU conditionality follows the strategy of “reinforcement by reward”: whether incentives will be rewarded or withheld is dependent on compliance, but neither extra costs will be inflicted (“reinforcement by punishment”) nor unconditional assistance provided (“reinforcement by support”) (ibid. 2004: 663-664, 2005b: 11). The core hypothesis of the EIM is that a target state adopts EU rules if the benefits of incentives surpass the ‘domestic adoption costs’. The cost-benefit calculations are based on: “(i) the determinacy of conditions, (ii) the size and speed of rewards, (iii) the credibility of threats and promises, and (iv) the size of adoption costs” (ibid. 2004: 664, 2005b: 16). The size of adoption costs of a government is considered as crucial for the effectiveness of conditionality which depend on the preferences of both the government and of ‘veto-players’ (ibid. 2004: 666-667, 2005b: 16-17), that is “individual or collective actors whose agreement is necessary for a change of the status quo“ (Tsebelis 2002: 19). In addition to the EIM, Schimmelfennig and Sedelmeier (2005a) add two alternative models of external governance which are informed by constructivist theorizing and assume a logic of appropriateness: (1) the ‘social learning model’, which hypothesizes that “a state adopts EU rules if it is persuaded of the appropriateness of EU rules “ (ibid. 2004: 667-668, 2005b: 18-20); (2) the ‘lesson-drawing model’ assumes the actors’ instrumental rationality while it holds that “a state adopts EU rules, if it expects these rules to solve domestic policy problems effectively” (ibid. 2004: 668, 2005b: 22-25). According to the ‘social learning model’, (1) the greater the legitimacy of EU rules, (2) the greater the identification of the target government and society with the EU and (3) the higher ‘domestic resonance’ toward EU rules, the greater the likelihood of EU rule adoption will be (ibid. 2004: 667-668, 2005b: 18-20). In the subsequent paragraph the main empirical findings on (non)compliance with EU conditionality will be discussed. In this way, potential gaps in research and starting points for future studies are identified. Taking into account that the effectiveness of EU conditionality may differ across different issue areas and stages of the enlargement process (cf. Sedelmeier 2006: 6), it turns out to be useful to distinguish between ‘democratic conditionality’ and ‘ acquis conditionality’. Concerning democratic conditionality, domestic adoption costs and credible threats (exclusion, suspension of negotiations) and promises (association, membership) have been identified as the key variables for rule adoption (cf. Morlino/Magen 2009b: 253; Schimmelfennig/Sedelmeier 2005c: 211; Youngs 2009). By contrast, the inconsistent use of conditionality and the apparent lack of a determined timetable for future accession may decrease both incentives and credibility, which seems to have decelerated rule adoption in the WB (cf. Pridham 2007: 459; Sebastian 2008: 5-6; Vachudova 2005: 252). The fact that certain conditions (such as compliance with minority rights and the Dayton Peace Accord, ICTY cooperation) are not part of the acquis may imply a lack of determinacy and legitimacy of EU conditionality. However, at least for the field of minority protection it was shown that it did not matter for compliance whether rules were also binding for EU member states, even though the EU’s demands differed considerably between candidate states (e.g. Kelley 2004a; Schimmelfennig et al. 2003: 515; Schimmelfennig/Sedelmeier 2005c: 214-215; Schwellnus 2005). Rather it appears that in the case of minority rights the gap in membership legislation could be offset by concrete demands in official EU documentations and the consistent way the member states insisted on full compliance as a precondition for membership (cf. Schimmelfennig 2005a: 119-121; for a more critical assessment see Sasse 2005). Yet large material and symbolic benefits and high credibility alone do not provide for compliance with democratic conditionality. Rather, one has to take into account domestic adoption costs, too (cf. Ethier 2003: 117; Leeds 1999). In an analysis of the effects of membership incentives on compliance with EU conditionality in East and South East Europe, Schimmelfennig identified the party system as a crucial independent variable for external influence on domestic rule adoption (2005b: 855-857, 2007: 132-135). In an “anti-liberal” party constellation adoption costs will be prohibitive, whereas in a “mixed” constellation liberal parties adopt democratic rules which raise the costs for subsequent anti-liberal coalitions to reverse course. Regarding “liberal” party constellations, Schimmelfennig found that norm compliance depended on the issue area: if it was not contested, conditionality was unnecessary and the external actor could create a “virtuous circle” (cf. 2005b: 856, 2007: 133- 134). However, if the norm was contested (e.g. in the case of minority issues in Latvia and Estonia), conditionality had to be applied and, at least in the case of CEE countries, ultimately proved successful (Schimmelfennig 2005b: 835-837, 2007: 133-134). Similarly, if domestic veto players were confronted with low or negative costs, normative pressure and efficient assistance proved sufficient for rule adoption in ‘low-politics’ areas, e.g. rather technocratic reforms of the judicial system (cf. Morlino/Magen 2009b: 234). On the other hand, given moderate adoption costs, high incentives and credible conditionality proved to be sufficient for the EU to manipulate the target government’s costs-benefits calculations in favor of rule adoption (cf. Schimmelfennig/Sedelmeier 2005c: 222). In autocratic and authoritarian states, however, thorough democratic reforms would imply exorbitant (power) costs to the incumbent regime. Additionally, in more fragile democracies the EU might ‘lock-in’ democratic reforms: in times when reform-friendly liberal democratic forces form the government, EU rules are adopted which leaves subsequent authoritarian or populist governments with a fait accompli and implies extra-costs to revoke reforms (cf. Schimmelfennig/Sedelmeier 2005c: 222; Schimmelfennig 2007: 135). Yet it is contested whether such ‘lock-in’-effects can be fully explained within purely rationalist argumentation, since it may have been due to persuasion or socialization effects that rather authoritarian forces preserved democratic rules and institutions once they reached power(cf. Börzel/Risse 2009: 15-16; Checkel 2005a: 809). Yet conditionality and external incentives can also work indirectly through the empowerment of domestic ‘change agents’ and the relative weakening of veto-players (cf. Morlino/Magen 2009: 31). Change agents or ‘norm entrepreneurs’, be they state or social actors, direct attention to democratic rules and, as a political strategy, change the way certain norms are perceived and talked about (cf. Finnemore/Sikking 1998: 897-899). This ‘framing’ aims at mobilizing public pressure in order to raise costs of reform-recalcitrant elites and redefines identities and interests of domestic decision-makers and the broader public via processes of persuasion and social learning (Johnson 2006). In order to be successful, however, the public must be perceptive for ideas of democratic change in specific issue areas (or even ready to overthrow the regime) and the government/autocracy must not be sufficiently consolidated to suppress or marginalize democratic opposition (cf. Schimmelfennig/Sedelmeier 2005c: 214). To promote its external governance the EU sometimes also delegated command and control as well as consultancy tasks to other international organizations, e.g. to the OSCE in the WB (with regard to the setup of the Stability Pact in 1999). Apart from that, there areb also cases of “parallel conditionality” (Schimmelfennig/Sedelmeier 2005b: 15) when the EU’s leverage on domestic rule adoption is enhanced by other external actors, such as the US and NATO in the Balkans (cf. Schimmelfennig 2005: 22 for CEE). In contrast to political conditions for membership, acquis conditionality does not directly affect the fundamental institutions of political power and therefore does not directly threaten the political survival of the target government. As concerns acquis conditionality, according to the empirical results of Schimmelfennig and Sedelmeier, a credible membership perspective and dependence of accession on (full) compliance with specific rules turned out as the key factors for rule adoption in CEE, whereas adoption costs and veto players mattered only with regard to the timing of rule adoption (cf. 2004: 673, 2005c: 210-211, 226; see also Hofer 2008: 175-180). As soon as aquis conditionality was applied in a certain issue area, formerly “patchy and selective” rule adoption has been detected to increase considerably, which is “a consistent feature across countries and issue areas” in CEE (Schimmelfennig/Sedelmeier 2005c: 215). As has been found for CEE, once the membership perspective has become credible, the target government apparently rather considered the aggregate benefits of membership than the benefits in particular issue areas in its cost-benefit-calculations (cf. Schimmelfennig/Sedelmeier 2005c: 215-216). Therefore, Schimmelfennig and Sedelmeier argue that in this case domestic power costs and the domestic veto player structure will rather delay than impede rule adoption while no systematic effect on the likelihood of rule adoption could be identified (cf. 2005c: 216). Another important domestic variable is the institutional and administrative capacity as the government might simply lack the resources to effectively manage and coordinate large bureaucracies or to sufficiently command (and/or socialize) veto-players within the state apparatus which will affect especially rule implementation. External incentives, however, fall short to explain instances of rule adoption when external incentives were low or absent (cf. Grabbe 2006: 201; Schimmelfennig/Sedelmeier 2005c: 220). Moreover, during the transition, domestic reformers both in the CEE and in the Balkans have been looking for external templates for the modification or invention of domestic rules (cf. Grabbe 2001: 1014). However, little knowledge exists about which factors facilitate or obstruct the internal and/or external diffusion of European ideas: “[l] esson-drawing and/or mimicry is probably the least researched area […] with regard to Europeanization” [emphasis in the original] (Börzel/Risse 2009: 13). Incentive-based strategies aim at modifying behavior which makes them effective when it comes to the imposition of institutions and formal adoption of norms. Thereby they help to lock-in domestic reforms. However, mere conditionality policies are unable to cause genuine implementation and internalization of norms (‘real change’) and may even provoke counterproductive effects, when monitoring and the threat to be punished crowd out integrity and intrinsic motivation (cf. Morlino/Magen 2009b: 255; Richter 2009b: 111; Schimmelfennig 2005b: 831). A similar point is made with regard to a possible subsequent slowdown of compliance and implementation or outright reversal of norms once states have gained membership status (cf. Falkner/Treib 2008; Grabbe 2006: 204; Schimmelfennig/Sedelmeier 2004: 676; Treib/Falkner 2008: 165). However, recent findings of enduring compliance among new member states after their accession with both acquis and less formalized EU rules challenge the fundamental role of conditionality for compliance that dominates the rational choice literature (Epstein 2008b; Falkner/Treiber 2008; Pridham 2008; Schimmelfennig/Trauner 2009). Rather, it seems that strategic bargaining mechanisms must be accompanied and complemented by other means of socialization such as shaming and normative suasion to promote domestic change and provide for long-term democratization effects (see Checkel 2001: 563, 2005: 803; Kelley 2004b; Richter 2009b: 97, 106; Schimmelfennig 2003: 281-287). The research design is a “within-case-analysis” of a “focused” and “structured” (George/Bennett 2005: 67) single case study that applies process-tracing to systematically place politics in the temporal context (Pierson 2004). As the aim of any research is “to make valid descriptive and causal inferences” (King et al. 1994: 3) I will adhere to the authors’ advice to separate the research process into four elements: “the research question, the theory, the data, and the use of the data” [emphasis in the original] (King et al. 1994: 13). Besides, whether qualitative or quantitative, scientific research is valuable as long as it meets four criteria: “(1) [t]he goal is inference”, (2) “the procedures are public”, (3) “the conclusions are uncertain” and (4) “the content is the method” [in bold letters in the original] (King et al.1994: 7-9). The last decade in political science has brought about what Bennett and Elman (2006: 455) label a “renaissance in qualitative methods”, while ultimately “researchers invariably face a choice between knowing more about less, or less about more” (Gerring 2007: 49). Case studies are regarded as “valuable in testing hypotheses and particularly useful for theory development” as well as being effective in “achieving high conceptual validity” (George/Bennett 2005: 4). As Pevehouse (2005: 11) contests, there is a “dearth of research on the link between international organizations and democracy”. Moreover, no meta-theory about EU enlargement or international democratization has been developed yet (cf. Richter 2009: 28). Furthermore, the number of countries which are subject to ICTY-related conditionality is very limited and the cases are highly complex. Finally, cases of reversal resistance and failure of EU conditionality have been mostly excluded from theoretically informed research, so there still is little in-depth knowledge about crucial factors and variables that hinder or enable EU ‘rule extension’ to third countries (cf. Elbasani 2009: 5; Magen/Morlino 2009: 13). Therefore, notwithstanding the shortcomings of single case studies (cf. Pierson 2004: 139-142) a case study approach is suitable for this particular research purpose to (potentially) uncover causal mechanisms which might be at work in other comparable cases as well (cf. Georg/Bennett 2005: 114-115; Bennett/Elman 2006: 462). The case of Croatia is particularly worth of scrutiny as despite favorable conditions in light of the democratization process and swift EU association after 2000, EU ‘rule extension’ in the war crimes issue turned out to be only partially successful. The research design is “structured” since the investigation of identical, carefully selected variables is standardized, and, besides, it is “focused” on a specific research objective (George/Bennett 2005: 67), namely variation in Croatia’s compliance with EU rules on ICTY cooperation. Moreover, as I already stressed in the introduction, the EIM complemented by the ‘external governance approach’ provides the “theoretical focus appropriate for that objective” (ibid.). Yet to demonstrate that hypothesized causal mechanisms were at work between the independent variable (systems of EU rules) and the outcome of the dependent variable (compliance with EU rules) it is necessary to identify “the intervening causal process – the causal chain and causal mechanism” (George/Bennett 2005: 206-207; cf. Bennett/Elman 2006: 459). A promising method to uncover “a series of theoretically predicted intermediate steps” (Checkel 2005b: 5) is process-tracing which, “if done properly, […] places theory and data in close proximity” (Checkel 2005b: 22). 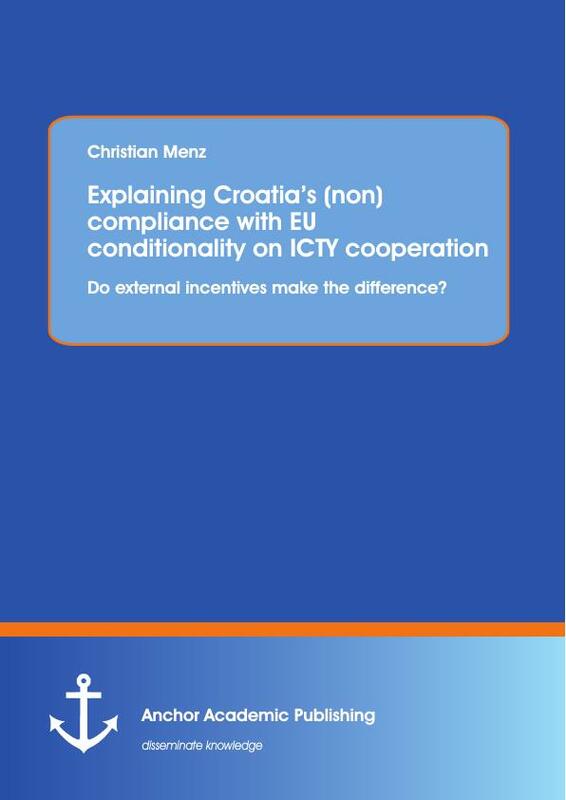 Moreover, examining ICTY-related EU conditionality in Croatia fulfills two basic methodological conditions. Firstly, a question should be raised “which is ‘important’ in the real world” [emphasis in the original] (King et al. 1994: 15; cf. George/Bennett 2005: 69). Secondly, the study should increase scientific knowledge in a particular scholarly literature (ibid.). Data to trace these processes within the case study comprise primary sources, media reports and secondary literature that largely remains descriptive to provide for a transparent and comprehensible research process. European Union 2003: Annex A). The SAP is made up of exceptional trade measures, financial assistance and, most importantly, the Stabilization and Association Agreement (SAA). The principle of democratic conditionality of reward was explicitly integrated both in the CARDS (Art. 5) and the IPA (Art. 21) Council Regulations on financial assistance which has enabled the EU to suspend project funding in case of non-compliance with its rules (Council of the European Union 2000, 2006). In the light of a perceived “enlargement fatigue”, the experiences of the latest enlargement rounds and the difficult task of enlargement in the WB ahead, the EU in December 2004 introduced new instruments to enlargement politics and tightened its conditionality approach. Regarding democratic conditionality, the Council, acting by qualified majority, “in case of a serious and persistent breach” of democratic principles received the right to suspend accession negotiations and lay down the conditions for resumption (European Council 2004c: point I.8.23). Western Balkans is the official EU term for the countries of former Yugoslavia minus Slovenia, yet including Albania. Third country means any country that is not a member state of the European Union. Nonetheless, my goal is not to falsify the empirical validity of the EIM, since “contrary to naïve Falsificationism, no experiment, experimental report, observation statement or well-corroborated low-level falsifying hypothesis alone can lead to falsification” (Lakatos 1978: 35). The abstract concept of the ‘second-image-reversed’ theory goes back to the ‘three images’ theory by Waltz (1959) who elaborated on the determinants of war. He distinguished between a first level of individual statesmen (“first image”), a second level of individual nation states (“second image”) and a third international or “systemic” level (systemic causal factors, that is the “third image”). While Waltz elaborated on each of the three different causal mechanisms, the third image built the backbone of his argumentation. Gourevitch (1978), on the other hand, did not focus on domestic causes and international effects (“second image”), but instead on international causes and domestic effects (“second image reversed”). Since the external governance approach tries to capture the whole compendium of EU external action across countries, regions or policy areas it also includes formal relations with third states beyond enlargement, e.g. in the context of the European Economic Area (cf. Lavenex 2004: 682-684). Moreover, not necessarily contractual relations are needed for the ‘diffusion’ or ‘transfer’ of rules, as it may happen either spontaneously in cases of high interdependence (cf. Lavenex/Schimmelfennig 2009: 79) or if third states regard certain EU rules as adequate for problem-solving and consequently adopt them by themselves. Schimmelfennig and Lavenex (2009: 796, 799) add a “market” mode of external governance, but since markets by definition act unintentionally, they qualify as nothing but a steering instrument (cf. Börzel 2006: 80). In contrast to the EU’s supranational ‘community method’ vis-à-vis its member states, non-member states are formally free to choose whether or not they want to subordinate to EU law. Practically, however, the power asymmetry between the EU and potential candidates often leads to “quasi-hierarchical” relationships which also are a necessary (but insufficient) condition for EU conditionality to be effective (cf. Börzel 2006: 86; Lavenex/Schimmelfennig 2009: 796; Moravcsik/Vachudova 2003). In general, networks can be either (1) intergovernmental (involving public actors only), (2) social (only private actors), or (3) public-private (public and private actors cooperate on equal footing) (cf. Börzel 2006: 79). Schimmelfennig et al. distinguished between an “intergovernmental channel” and a “transnational channel” (2003: 498): in the first case the EU addresses governments directly while in the latter it exerts influence via societal actors in non-member countries. This dispute marks the debate between rationalist institutionalism and sociological (constructivist) institutionalism in comparative politics as well as between rationalism and constructivism in IR theory. In the words of March and Olsen, “[h]uman actors are imagined to follow rules that associate particular identities to particular situations, approaching individual opportunities for action by assessing similarities between current identities and choice dilemmas and more general concepts of self and situations” (1998: 951). According to the constructivist IR theory of ‘deliberative/argumentative behavior’ (which draws from Habermasian social theory) competing actors in discursive processes put aside their individual interest or preferences to agree on the “better argument” which shall then become the basis for subsequent action (cf. Risse 1999, 2003: 111-115). In the words of Finnemore and Sikkink, “rule internalization” has occurred once “norms acquire a taken- for granted quality and are no longer a matter of broad public debate” (1998: 895). Methodologically, however it is very difficult to detect that rule implementation and/or internalization have actually taken place (cf. Morlino/Magen 2009b: 242). The EIM’s hypothesis on adoption costs reads: “[t]he likelihood of rule adoption decreases with the number of veto players incurring net adoption costs (opportunity costs, welfare, and power losses) from compliance” (Schimmelfennig/Sedelmeier 2005b: 17). Also see Engert (2003: 54) and Morlino/Magen (2009a: 44-45) who use very similar hypotheses in their analytical frameworks. See table 1 in the annex for an illustration of the overall theoretical model applied by Schimmelfennig and Sedelmeier (2005a). There are different ways to conceptualize the instrument of conditionality. ‘Negative conditionality’ is applied through non-military, yet coercive economic, political and diplomatic measures. By contrast, ‘positive conditionality’ rewards compliance with the provision of symbolic or material incentives. For reasons of scope and due to the particular focus on Croatia in the empirical part of this paper, I concentrate the following discussion of compliance with EU conditionality on those countries the EU officially offered the prospect of future membership. For an overview of empirical findings on the overall shape, effectiveness, and crucial mechanisms of EU ‘rule transfer’ via the ENP and beyond Europe see Börzel (2010), Gawrich et al. (2009), Jünemann/Knodt (2007), Magen et al. (2009), Nwobike (2005), Schimmelfennig (2009), Schimmelfennig/Scholtz (2008), Youngs (2001). ‘Democratic conditionality’ refers to the basic political foundations of the Union, such as human rights and liberal democracy, whereas ‘acquis conditionality’ concerns the concrete rules of the acquis communautaire. According to Schimmelfennig and Sedelmeier, the main incentive for compliance with democratic conditionality are, first, the setting up of institutional relations and, once this has been achieved, the opening of accession negotiations (cf. 2004: 669). As soon as concrete accession negotiations start, acquis conditionality sets in, i.e. compliance with the rules of the acquis communautaire is established as a precondition for further association. Consequently, the major external incentive for compliance with acquis conditionality is EU membership (cf. ibid. 2004: 669, 2005c: 212). Nonetheless, this distinction is rather conceptual since both acquis and democratic conditionality can overlap or alternate in being the most important mechanism (cf. ibid. 2005c: 212). For example, the approval of official candidate status in 1999 and the opening of accession negotiations in 2005 boosted the credibility of Turkey’s membership promise. Apparently, that is why Turkey subsequently realized thorough human rights reforms (cf. Morlino/Magen 2009b: 229-232; Schimmelfennig 2005a: 121). Morlino and Magen found a similar nexus at work in of Romania, Serbia and the Ukraine (cf. 2009b: 229). It seems that in CEE the legitimacy of rules neither had a negative impact on the adoption of rules from the acquis. Neither the lack of EU competences vis-à-vis member states nor if member states ex post delayed access to the benefits or a patchy implementation record among the member states were found to have a negative impact on rule adoption, e.g., in the fields of free movement of people, administrative reform or social policy (cf. Schimmelfennig/Sedelmeier 2005c: 217-218). Nonetheless, such behavior apparently weakened the EU’s and the member states’ bargaining power which led to concessions toward the new member states (ibid.). The following argumentation is based on the assumption that – if political contestation and free elections are guaranteed – not only the incumbent government, but all major competitors will include external demands in their cost-benefit calculations since each of them may form part of a future government (cf. Schimmelfennig 2005b: 835, 2007: 132). The party constellation in Croatia was identified as “mixed” by Schimmelfennig (2007: 139; 2005b: 842). Therefore, in countries like Slovakia, Bulgaria, Romania, Croatia or Serbia the EU’s democratic conditionality turned out to be ineffective until democratic governments took over; a similar situation persists in Belarus today (cf. Schimmelfennig et al. 2003; Schimmelfennig/Sedelmeier 2004: 669-670, 2005c: 214; Rontoyanni/Korosteleva 2005; Vachudova 2005: 4, 98-104; Youngs 2009: 897). Also see Grabbe (2006: 202-203) on how socialization effects changed domestic actors’ behavior in CEE. Snow et al. (1986) refer to this strategic activity as “frame alignment”: “[b]y rendering events or occurrences meaningful, frames function to organize experience and guide action, whether individual or collective” (1986: 464). For the concept of ‘strategic framing’ see also Goffman (1974), Snow and Benford (1988). In their study of ‘hardship cases’ (Romania, Serbia, Ukraine, Turkey), Morlino and Magen found that democratic conditionality was the least effective in those issue areas where relatively weak change agents encountered strong veto players whose power could only be challenged by external actors (2009b: 244-251). On the other hand, the OSCE often depended on the Union’s democratic conditionality for its own leverage, e.g. when the OSCE successfully introduced many of its human rights goals into the Stabilization and Association Agreement (SAA) with Croatia (cf. Richter 2009b: 247-249; also see Vachudova 2005: 253 for the case of the ICTY). Therefore, analyzing the OSCE’s effectiveness in rule extension (Richter 2009b) helps to illustrate EU conditionality and socialization mechanisms as the OSCE is not able to impose conditionality via hierarchical modes of governance for the lack of resources and power. Yet the OSCE might be more trustworthy among locals for the perceived lesser degree of politicization and the better crisis management compared to the EU in the 1990s which might be conducive for socialization processes and thus favour EU ‘rule extension’ (for the case of Serbia see Dallara 2009: 185). For example, in Serbia the EU referred to the OSCE and the Council of Europe when proposing its democratic conditionality policies in order to raise the legitimacy of its rules and consequently to enhance compliance. For an illustration of this mechanism regarding the issue of domestic war crimes trials see Commission (2004: 13). Additionally, if the EU clearly pointed out the salience of several issue areas toward the CEE countries, EU conditionality became more credible and hence rule adoption increased (cf. Treib/Falkner 2008: 161-164). See Elbasani 2009; Hille/Knill 2006; Treib/Falkner 2008: 165-168; Morlino/Magen 2009b: 250-251; Noutcheva/Bechev 2008; Richter 2009b: 379). As Schimmelfennig and Sedelmeier have found, countries like Slovenia, the Czech Republic, Hungary or Poland initiated both democratic and socio-economic reforms by their own initiative which implies that neither democratic nor acquis conditionality are necessary for rule adoption (cf. 2005c: 214, 218). Constructivist concepts of, on the one hand, normative rationality such as ‘mimicry’, ‘symbolic imitation’ and ‘isomorphism’ (Bikhchandani et al. 1998; DiMaggio/Powell 1991; Havemann 1993; Meyer/Rowan 1977; Polillo/Guillén 2005) or ‘social learning’ (Schimmelfennig/Sedelmeier 2004: 667-668, 2005b: 18-20), and, on the other hand, instrumental rationality such as ‘lesson-drawing’ (ibid. 2004: 668, 2005b: 22-25) or ‘deliberate emulation’ (Lavenex/Uçarer 2004; on ‘modes of emulation’ also see Jacoby 2004: 5-8) provide valuable insights why (and which) specific rules are chosen from a broader international compendium (cf. Jacoby 2004: 233-237; Schimmelfennig/Sedelmeier 2005c: 219). Moreover, they also outline the EU’s “enabling impact” when domestic actors refer to the Union to legitimize their own political agenda (Diez et al. 2006: 573, 578- 579). Thus, mechanisms of institutional isomorphism, policy transfer or policy diffusion may explain whether or not (and which) EU rules will be chosen (for an overview see Holzinger et al. 2007). In line with this, “[c]onsiderable evidence” has been found that state actors formally adopted rules while at the same time they obstructed implementation through the introduction of special amendments or the use of political interference and personal sabotage (cf. Grabbe 2006: 200-201; Morlino/Magen 2009b: 241-243; for the case of Croatia see Richter 2009a: 18). See Subotić (2009: 364-365) who, going beyond the case of EU foreign policy, similarly holds that once external pressure is lifted compliance in the field of international justice will remain incomplete – no matter if target states are prone to conditionality or to “symbolic international pressure”. For an analysis of the synthesis of rationalism and constructivism and a discussion on how a conjunction could generate valuable new theoretical insights and empirical results see Epstein (2008a), Fearon and Wendt (2005), Jacoby (2004: 20-40), Jupille et al. (2003), Ruggie (1998), Zürn and Checkel (2005), Wendt (1999). For a discussion of advantages and disadvantages of case studies see Gerring (2007: 37-63) and Yin (2009). Apparently, particular qualitative and quantitative methods may differ substantially. However, the “same logic of inference” applies to both (King et al. 1994: 3) and “[t]he product of a good case study is insight” (Gerring 2007: 7). According to Schelling (1998: 32-33), a ‘social mechanism’ is a “set of plausible hypotheses that could be the explanation for some social phenomenon, the explanation being in terms of interactions between individuals and other individuals, or between individuals and some social aggregate” . Nonetheless, next to the empirical insights gained from process-tracing and the possibility to combine it with other methods, it entails many potential risks and disadvantages, such as the subjectivity of the author (cf. Richter 2009b: 47, 83) or its limited contributions to theory-building (see Bennett/Elman 2006, 2007; Checkel 2005b: 17-21; Gerring 2007: 172-185; King et al. 1994: 85-87, 225-228). The 1993 Copenhagen criteria made EU accession dependent upon achieving “stability of institutions guaranteeing democracy, the rule of law, human rights and respect for and protection of minorities, the existence of a functioning market economy as well as the capacity to cope with competitive pressure and market forces within the Union […] [and the] Union’s capacity to absorb new members […]” (European Council 1993: 13). With the entry into force of the Amsterdam Treaty (1997) on May 1999, the political conditions for membership were institutionalized. Art. 6(1) states that the EU is “founded on the principles of liberty, democracy, respect for human rights and fundamental freedoms, and the rule of law, principles which are common to the Member States” (Art. 6). Any European state that accepts these principles may apply to become a member state (Art. 49). See European Council (1997) for a list of the conditions to be fulfilled by the WB countries. The 1997 criteria also became the conditionality framework of the EU’s Regional Approach of 1996 which set out the guidelines for the EU’s uniform approach to the WB countries (European Council 1996). Moreover, on 17 May 1999, amid NATO’s ongoing air campaign against Serbia, the EU foreign ministers launched the Stability Pact with similar entry requirements and conditionality policies as with regard to the Regional Approach (European Council 1999). For an overview of the current stage of accession negotiations of the individual WB countries see table 2 in the annex. Besides, it was announced that during the accession process each state will be evaluated by its own progress, thereby introducing the so-called principle of ‘each-by-its-own-merits’ (see Vachudova 2005: 112-120). At the Feira European Council (June 2000) the EU for the first time explicitly distanced itself from the uniform approach and set up differentiated recommendations for each of the WB states (cf. European Council 2000). The European Partnerships – that were modeled on the Accession Partnerships of CEE – identified different priorities for every WB country which are to be met within a short term (12-24 months) and medium term (3 to 4 years). All WB countries except Serbia were eligible to receive funds from the OBNOVA (1996-2000) and PHARE programs until 5 December 2000 when they were replaced by CARDS. On 1 January 2007, the IPA (Instrument for Pre-Accession Assistance) was introduced to streamline the EU’s financial allocations and to substitute for CARDS, PHARE, ISPA and SAPARD. Besides, as an additional incentive to comply with EU rules, a clear differentiation between ‘potential candidate’ and ‘candidate’ countries was introduced qualifying the latter for additional IPA-funds which in total sum up to almost €11.5 billion for the period between 2007 and 2013 (Council of the European Union 2006b). Thereby, the EU established “one of the most comprehensive conditionality clauses ever embodied in a Community legal instrument regulating external assistance” (Pippan 2004: 232). Since then, once accession negotiations start, the acquis is broken down into specific chapters while the Council may lay down benchmarks for the suspension or (re)opening of each chapter. Moreover, permanent ‘safeguard clauses’ can be introduced. See European Council (2004: point I.8.23) for the new framework of enlargement negotiations. The tightened democratic conditionality approach has been reiterated and specified in the subsequent enlargement strategies (see Commission 2005a: 3, 2006: 5-7). See Fierro (2003), Pippan (2004), Pridham (2007) and Sjursen/Smith (2003) for a detailed discussion of both the application and the content of EU conditionality.